Hand crafted custom guitars built with quality products to ensure great sound and playability and careful creative workmanship to give a unique "head turning" style. Who and what is Cruzcaster Custom Guitars? I live in Powell River, a remote town on the coast of British Columbia, one of the most beautiful parts of the world. I've played guitar since I was a kid and have always loved music, learning mouth-harp, some piano and later on getting a slide resonator guitar and a banjo to round out the fleet. Everything was acoustic but then one day I thought I'd try electric and discovered a whole new world. I ended up liking the simplicity and sounds of the Telecasters and have had several including one of the earliest years of the Japanese Squire Tele's and also a 1973 Telecaster Custom which I still have. Of course I had to get into nice tube amps to really enjoy the experience. I work in a local music store, Rockit Music, doing all of the repairs and setups. I really don't know how the Cruzcaster idea came to be, but here I am. 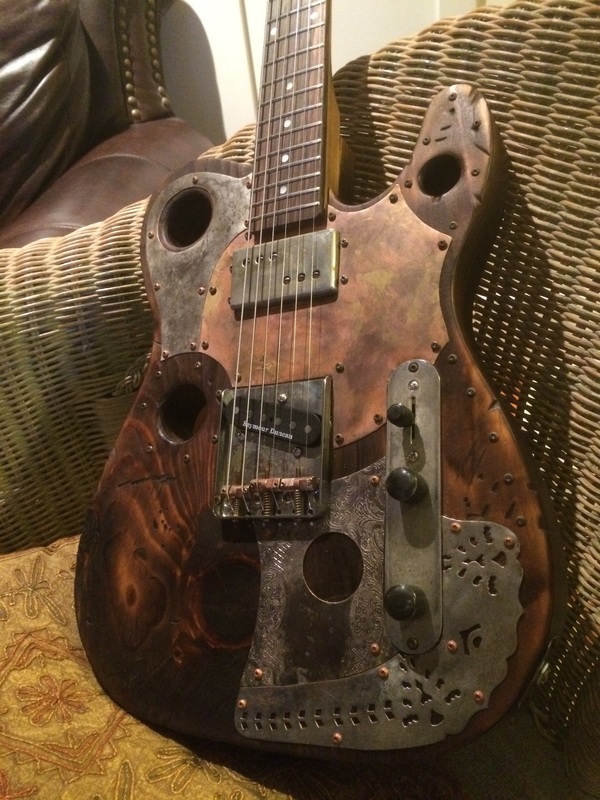 I am wanting to build unique, creative, quality guitars. I start out with an unfinished raw wood body and am figuring out new ways to make visually interesting instruments. I have some very rugged finishes and lately some "Sharp Dressed Men". I burn, brush, sand, beat, stain, dye, the body and then finish it with a few thin coats of Nitro. I have tried several aftermarket necks and have settled on two sources that I like. They are one piece maple with rosewood fretboards, medium C, 9.5” radius, 42 mm nut and a double action truss rod. I work in a music store doing setups and repairs and have a good reputation here for the work I do. I spend more time on the neck than the body. I fasten the neck to my bench and level the frets and then crown and polish them. I smooth the ends of each fret and then do a small rollover on the fretboard for more comfort. I hand file a bone nut as the finishing touch. 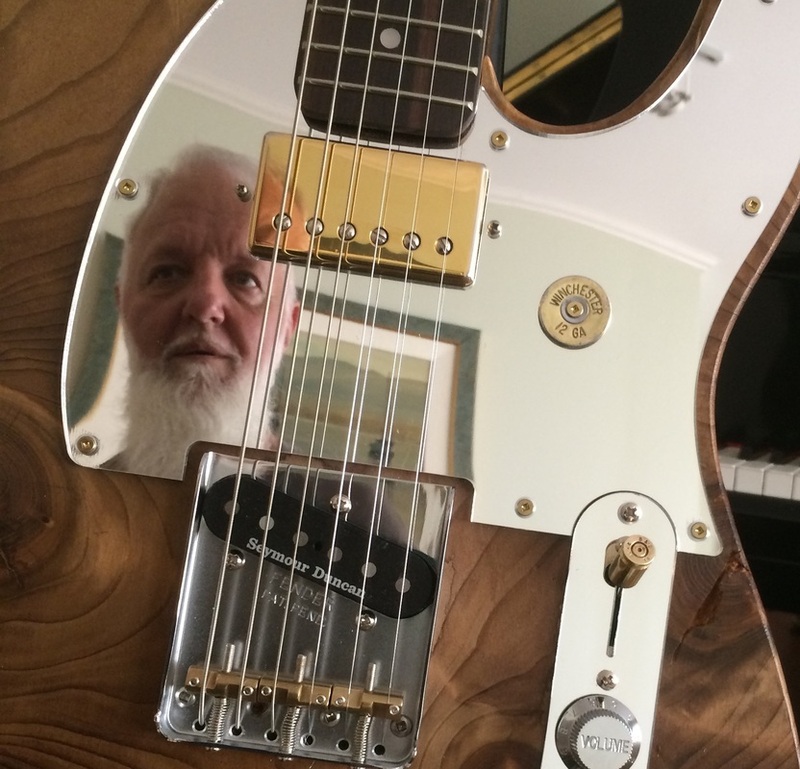 I am using quality components, Fender or Wilkinson brass bridges with three compensated brass saddles, Grover or Wilkinson tuners and full size tone and volume pots. I use several types of pickups but mostly Seymour Duncan,Fender or GFS . Not all of by guitars are under the "guitars" heading on this site because there are getting to be too many, so I have deleted some that are similar. Most of them are on the "gallery" heading. Check out my "Custom Shop" for details on how to have a guitar custom built for you.